This is obviously not a vintage power supply, but it will have to do until a nice old HP unit can be found that needs a bit of repair. 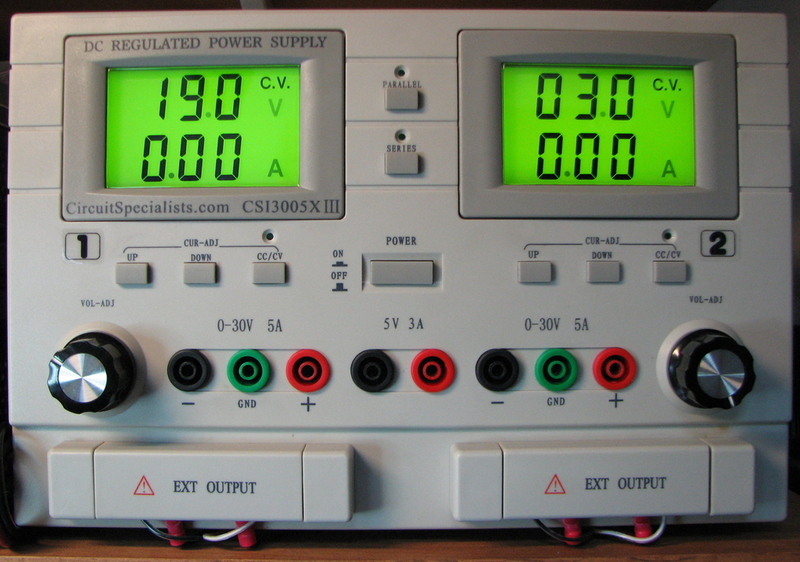 Triple-output with two 0-30V 0-5A outputs and one fixed 5V 3A output. Reasonable quality for an inexpensive Chinese-made unit. Pushbutton style interface for current limit is clunky, regular knobs are better. Original10-turn pots have been replaced with decent Bourns parts. I had a look at the schematic for this psu. i was supprised to see no special driver/feedback chip, just op amps and reference driving the output transistors. Dont look bad for a china made psu though, has it played up at all since your purchase? It is indeed a tried-and-true design, one that I can easily understand and fix if something goes wrong. The first problem I found was the cheap 10-turn pots with wipers that would go open as you turned, leading to voltage spikes. Bad!!! I got tired of them and replaced them with good Bourns pieces. Also had a problem with the fixed 5V 3A output. I found out it would not deliver the rated current at all one day without severe voltage drop. I ripped into the unit and found an LM723-based board driving that output. And it was working perfectly. Turns out, the lugs bolted to the front panel banana jacks were improperly crimped, and that’s where the voltage drop was. Typical haphazard manufacturing and quality-control problems you find with this level of equipment. But other than those issues, it has worked as advertised. Full rated current available on all outputs, no smoke releases. The 3 op amps that drive the transformer range relays seem a clever way, but i had a frend that wanted something similar and i said to use a lm3914 bargraph/dot chip to drive relays, he never got to do that mod as he passed away the same month. For my crude use i bodged together a very crude duel psu for 3-20v at 5A, L200 regulators driving 2n3055 transistors. My favorite regulator is the LM317, just two resistors and its programmed, easyer than falling off a log lol. And second best is the 78xx series fixed regulators, the workhorse of many older bits of equipment and home computer uses. The L200 is great but it cant take mild heat and shuts down unless its almost welded to a heatsink, i think the protection side is too sensitive.